About the LDM Group - Turning under performers into over achievers. Lee Dillon has established credentials in a range of enterprises, beginning with luxury boating, then extending into property development, corporate consulting and ventures in IT and hospitality. 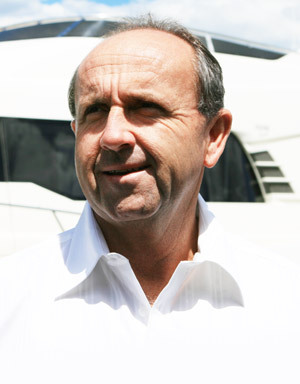 His achievements have included establishing a dealership which sold and serviced Australia’s leading and most-awarded powerboat range. His dealership subsequently grew to become the country’s leading Riviera dealership, both in terms of customer service, quality and profitability. Very soon his first operation at a single location expanded into a second location, and then ultimately extended to a network of four dealerships in NSW. A deep-seated philosophy of adding value rather than simply cutting the price in order to build turnover has regularly paid dividends. In his luxury motoryacht dealership, owners were regularly invited to rendezvous events, which inevitably led to increased loyalty and contributed to repeat business. Rather than simply selling the boat, Lee Dillon Marine sold the dream. Even today, powerboats bearing the LDM badging regularly trade well above equivalent boats on the open market. Subsequent business ventures have included a number of property development projects. Working in collaboration with a leading commercial property identity, Lee developed an industrial complex on Sydney’s Northern Beaches. There have also been various residential housing projects. More recently, two land developments in the Central West of NSW have grown to become thriving residential communities. Both subdivisions sold out quickly while less prepared developments presented by competitors languished amid challenging market conditions. With these land and property developments, as with other business ventures, a familiar pattern was seen. In typical Lee Dillon fashion, there has been a strong emphasis on utilising mass media advertising and publicity, over-delivering on all aspects of the product being presented to customers, and generously rewarding the sales force. These have returned big dividends in terms of sales and profits. Now that the Lee Dillon Group has firmly entrenched itself in hotel acquisition and management the same principles are being applied with similar results. Product, People, Promotion + Presentation = Profits.